Simple but powerful property management. 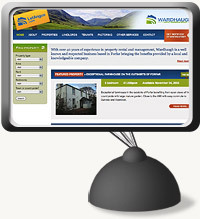 LetAngus.com is a property rental site originally developed for Wardhaugh Property Management in Forfar. It allows easy maintenance of the website as well as a catalogue of properties for rent. "Updating the site is so easy! We are able to change content, update properties and extend our offering at any time. Fly On the Wire delivered all our needs and continue to do a great job."